For some time, Google scientists have been experimenting with artificial intelligence using quantum devices provided by D-Wave. According to Google, the company’s Quantum Artificial Intelligence Lab will soon develop their own quantum hardware, most probably in a bid to secure novel technology. Quantum computers are set to be the next generation of computing devices capable of computations order of magnitude above what we use today – classical von Neumann computers. 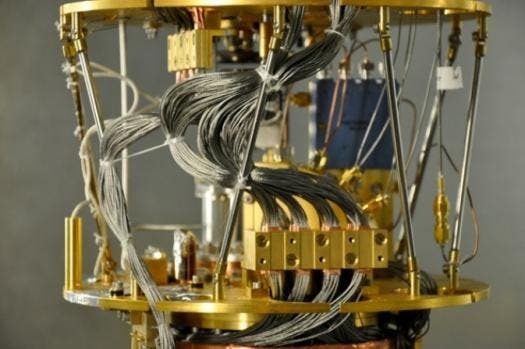 A while ago, we reported how D-Wave, the leading quantum computing private research company, wants to build a 1000 qubit quantum computer. In digital computing, a bit can either correspond to a 0 or 1. A qubit or quantum bit, however, can occupy two states at the same time – it can be a 0, a 1 or both at the same time (01, 10). Therefore, two qubits can be in the states 00, 01, 10, and 11 at the same time. For each added qubit, the total number of potential states doubles (two raised to the power n, where n is the total number of qubits). Hence, the use of qubits in certain kinds of computation could enable us to process exponentially larger quantities of data than it is possible with the same number of conventional bits. This is straight up Google’s alley, primarily a search engine which mines and peers through immense amounts of data every second. Considering how involved Google is in big data, besides driving search results (sensors, weather, maps, etc), the quantum computing dream is an extremely appealing one for the Mountain View enterprise. For this new project, the Quantum Artificial Intelligence team will be joined by Professor John Martinis and his team at UC Santa Barbara, recognized for their breakthroughsin building superconducting quantum electronic components of very high fidelity. With an integrated hardware group the Quantum AI team will now be able to implement and test new designs for quantum optimization and inference processors based on recent theoretical insights as well as our learnings from the D-Wave quantum annealing architecture. It’s important to mention that there’s still no working quantum computer out there, that we know of. Advances are reported on a monthly basis, but at this point it’s anybody’s guess when a quantum computer will surface.